With new study, girls' soccer coach Darryl Longabaugh says “we’ll have better awareness of concussion. The girls will learn how to train their bodies better, especially their necks." If a soccer player at one of Mississippi’s colleges or universities has good reflexes and motor skills that help with movement on the field, it could be a factor in whether or not they take a hit that results in concussion. But can their sensory abilities impacting movement be adjusted for the better on the front end, lessening their chances of concussion, and allowing them to recover better and more quickly if they do suffer one? A first-of-its-kind clinical trial by a research team at the University of Mississippi Medical Center aims to evaluate the effectiveness of aggressive physical therapy as “sensorimotor” training, which addresses the ability to take in sensory information and use it to direct your movement. 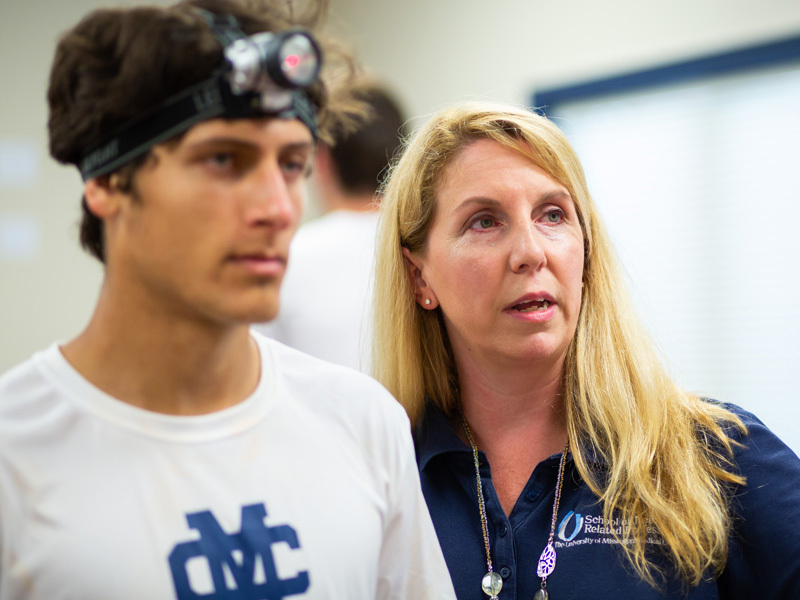 Dr. Jennifer Reneker, associate professor of physical therapy, and a team of faculty, residents and students are putting Mississippi College men’s and women’s soccer players through a month-long exercise regimen that will help lead them to the study’s conclusions. 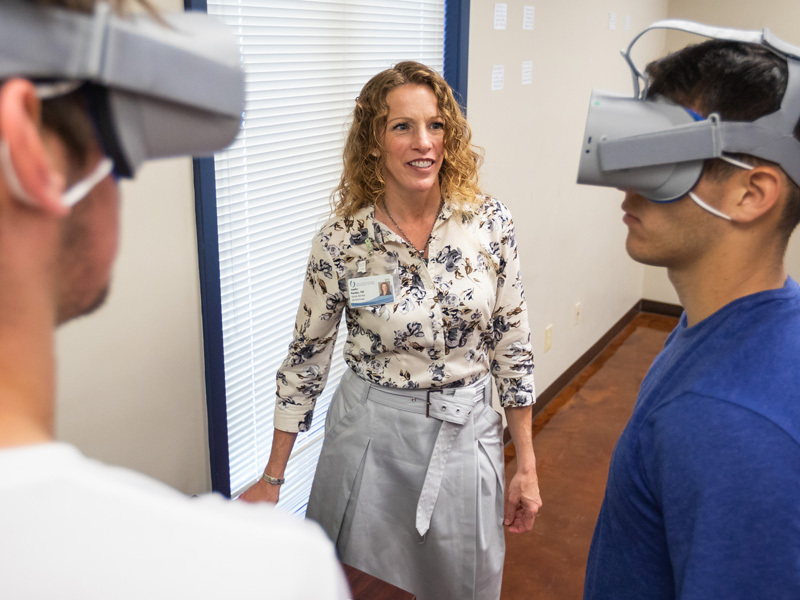 Dr. Jennifer Reneker, associate professor of physical therapy, watches as soccer players Victor Bazan and Jorge Fernandez play a virtual reality game to track a flying fish without moving their heads. “We’re taking healthy athletes, who have had a concussion in the past or not, and seeing if we can fine-tune their sensorimotor system,” Reneker said. “I believe that if they have any underlying impairments, we can remedy that and decrease their risk of injury. The trial, “Sensorimotor Training for Injury Prevention in Collegiate Soccer Players,” already is getting national attention on ClinicalTrials.gov. It’s funded through an internal research grant from UMMC’s Neuro Institute, which collaborates with researchers, educators, physicians and other health care providers at the Medical Center to build upon existing areas of strength in neuroscience in hopes of discovering new cures and developing improved treatments. 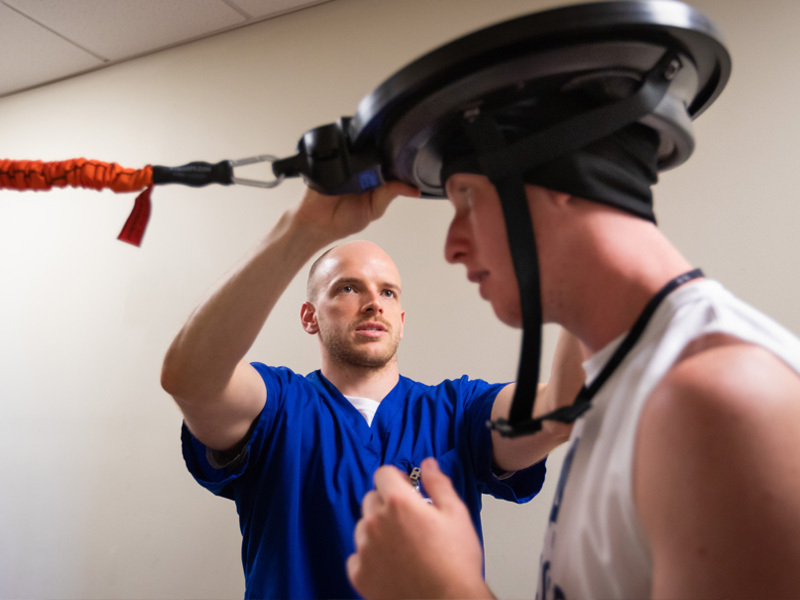 While working in Ohio before coming to UMMC in 2016, Reneker performed a clinical trial that studied very targeted, aggressive physical therapy “intervention” in athletes with a concussion to see if it would speed their recovery time after sustaining a concussion during sports. The group that had aggressive physical therapy got better faster than a control group that got no PT. “It showed us that sensorimotor training is effective in speeding recovery,” she said. The current clinical trial is looking at prevention of injury. MC soccer players 18 and older were invited to take part in the trial, which began August 11. 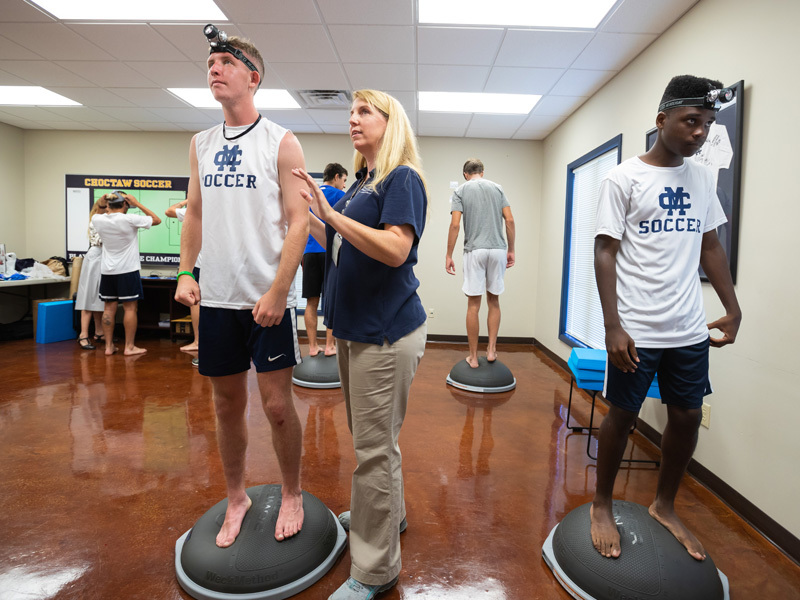 Dr. Kimberly Willis, associate professor of physical therapy, positions soccer players Cameron Allcorn, left, and Cayman Pearson on rubber stands that impact their balance to prepare them for a motor skills test. At the beginning of the trial, Reneker and her team performed baseline testing on 75 players that examined movement control of their eyes, their ability to use specific muscles in their neck in a controlled way, and their ability to focus their vision when their head is moving, among other things. They’ll be tested again on those same abilities following the four weeks of training to see if there’s improvement. “We want to see if there are any clinical changes. We’re doing this to see if they can decrease their risk of injury while playing soccer” as a result of the trial’s activities, Reneker said. Reneker and two others at UMMC – Dr. Cody Pannell, a physical therapy resident who received his doctor of physical therapy at the Medical Center, and Dr. Ryan Babl, an assistant professor of physical therapy – developed five different exercises for each of the eight sessions they will have with soccer players over the four weeks. That breaks down to two weekly sessions of aggressive physical therapy at MC for each athlete, led by UMMC team members. “We are training the same neurological pathways by using a variety of exercises,” Reneker said. In addition, she said, players are getting homework. “It’s all via video instruction. The home exercises are delivered on their cell phones, all on a private YouTube channel,” she said. “The link will be delivered by WhatsApp (a messaging app). 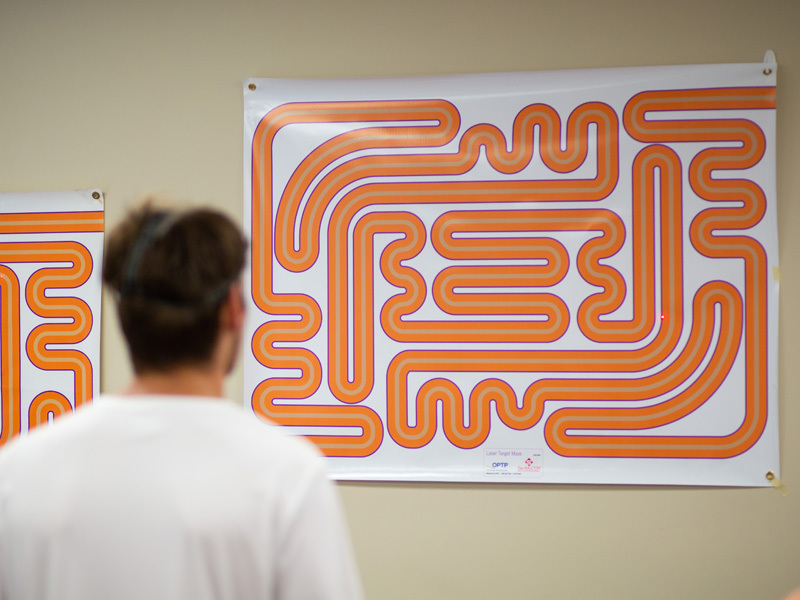 A Mississippi College soccer player uses a head-mounted laser to trace the path of a maze in an exercise to gauge eye control. Men’s soccer coach Kevin Johns said the therapy isn’t just for his players. “A lot of this is for myself,” said Johns, a 25-year coach, 16 of them at MC. “I want to learn about concussion. It’s a hot topic right now. I want to make a better environment for the kids, and for it to lead to fewer injuries. Babl’s role involves developing exercises targeting the deep cervical flexors of the neck, which are muscles having to do with positioning and motor control. “We will be teaching them how to activate and strengthen specific muscles, and to improve their endurance,” he said. Some of the exercises use a device called an Iron Neck to be strapped to the player’s head. “It uses a cuff to get a nice snug fit,” Babl said. “That allows us to tether a resistance cord to a fixed point, and it provides resistance for the muscles of the neck in each direction and for rotational movement when a player is in a sports-specific position. Tyler Luchtefeld, a physical therapy resident, affixes the Iron Neck to soccer player Cameron Allcorn's head to test reflexes and motor skills. Reneker and her team will compare the number of concussions and leg injuries suffered by the athletes this season with those recorded during the 2017. The exercise therapy will only last a month, but the UMMC team will track injuries for the entire season, she said. The soccer players include sophomore biology and pre-med major Caitlyn Sheppeard, 19, of Caledonia. She calls the exercise regimen “really cool. Willis explains to soccer player Bruno Cantoni how to use a laser to follow a maze pattern. Players are at their greatest risk for concussions when they have contact with another player, or when they fall, said Longabaugh, in his 22nd season as girls’ soccer coach. “We’ll have better awareness of concussion. The girls will learn how to train their bodies better, especially their necks,” he said.